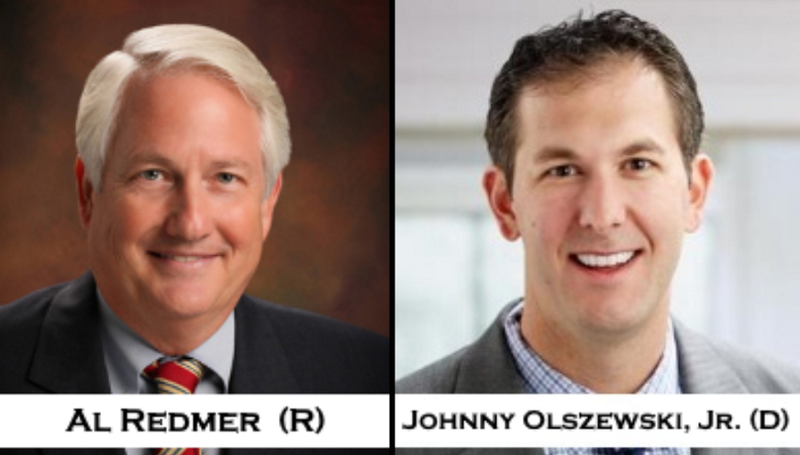 Four days before the scheduled debate between Baltimore County Executive candidates Republican Al Redmer and Democrat John Olszewski, Jr., one candidate has backed out of the event. 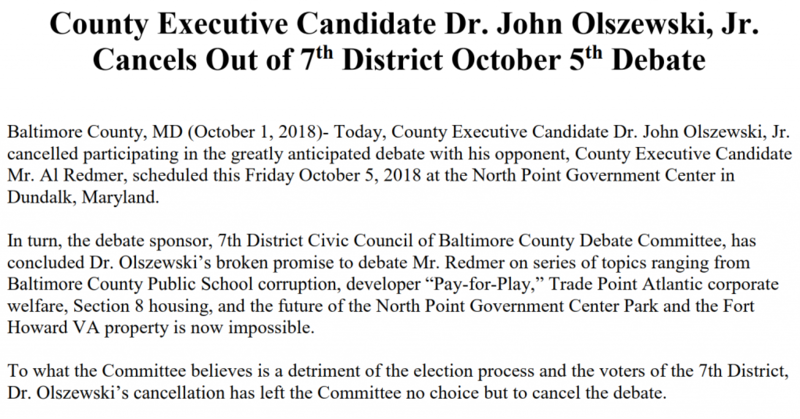 The Baltimore Post received notice in writing from the 7th District Civic Council (DCC) of Baltimore County, Inc. that Mr. Olszewski will not attend the debate due to a “scheduling conflict.” The debate was to be held at the North Point Government Center in Dundalk on Friday, October 5, 2018. A spokesperson for Johnny O’s campaign provided no other details, simply stating that a scheduling conflict will keep the Baltimore County Executive hopeful from attending the long-scheduled debate, which was first announced in a press release on August 19, 2018. We find it appalling that the candidate would back out of the debate at the last minute with no good explanation. Of course, this is not the only issue we have taken with Johnny O. 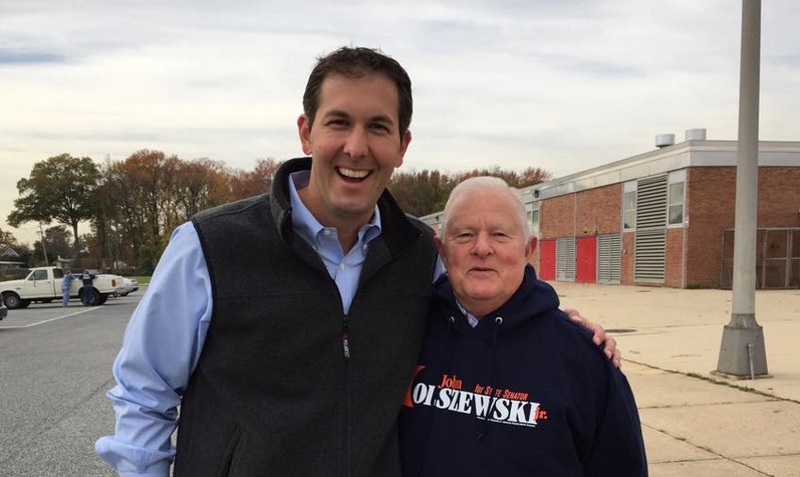 The Post has been critical of his ties to his father, former Baltimore County Councilman John Olszewski, Sr., who supported the sale of the former North Point Government Center. That boondoggle forced the relocation of the police precinct at a cost of $20 million to taxpayers. Mr. Olszewski, Sr., along with the Dundalk Renaissance Corporation, pushed to have the center turned into retail space. There was pushback from the community concerning the loss of the police precinct, as well as the loss of open space used for recreational purposes. At the time, Johnny O was serving in Annapolis as a Delegate to the 6th Legislative District. The Post and The Baltimore Brew also exposed Johnny O’s ties to Jim Smith, the former county executive whose campaign cash and push for political favoritism toward developers created a cesspool atmosphere within an old-style political machine. These shenanigans seem to be a trend for Johnny O, who was reportedly more than an hour late at another recent candidate forum in Middle River. Does this bode well for someone seeking to run Baltimore County? After all, holding the highest office in the county will require a full calendar of events that one needs to honor, especially when given advanced notice. If Johnny O can’t take his campaign seriously, then why should the voters of Baltimore County take him seriously as a candidate?